Week number two is finally in the books here. We saw six games come and go with only a few goals this week to even mention. Loads of draws across the land early on Saturday, but the night came with the goals as the Seattle-RSL game and Houston-San Jose game saw more action than the first couple in the day. So just what did week two bring us? A new saves leader in Kevin Hartman, an expansion club at the top of the standings, and a young Columbian leading all in goals scored (talk about a goal too!). I try to be quick in my recaps here this year, since I don’t see every game it should be a bit easier to do so. Say what you will about the result, you have to give it up to Toronto for getting four points out of their first two road games. I don’t believe last year’s squad would have come close to that. Their home opener next week will really give us a strong indication of how good they really are I think. Anyways, as far as this one went the Crew really handled the possession in this one and came up short in the end with the late own goal. Some shaky moments for Crew fans when MVP Guillermo Barros Schelotto went down in the second half. He came off shortly after but no word on his status. The one thing going against the Crew in this one had to be their finishing. They were missing Aljeandro Moreno to an international callup but for the most part the chances the Crew had came up short due to poor finishing. Big story though was probably the crowd. These two supporter groups are really making this rivalry into something good here that the league really needed. A couple thousand TFC supporters crossed the border to make the trip and it really added to the atmosphere at Crew Stadium. Oh yeah, those Crew fans showed up pretty nicely on Saturday too. DC looked better in this one but still found a way for the Fire to get back in it and tie things up late. I’ve been saying for weeks that people need to keep an eye on Patrick Nyarko for Chicago, this week he comes through with a big time goal to give the Fire a big road point. Like I said, DC looked better and the early goal from Luciano Emilio was very nice, maybe even goal of the week material. The Black-and-Red also seemed to do a good job controlling the midfield more this week against the Fire. Midfield was definitely bogged down a bit with the formation (3-5-2) that Tom Soehn put out on Saturday. Chicago had their fair share of chances in this one though. I wasn’t as impressed with them as I have been here so far in 2009. It’s almost like their wow factor wasn’t there except with Nyarko’s goal. The field was obviously an issue with the game too, very wet as we saw a lot of guys lose their footing throughout the game. Still it didn’t stop the large group of supporters for DC. Say what you will I still believe they are some of the best in the league, if not still the best. Another ho-hum kind of game for New England. Still they did enough late to get a road point. The late goal should be a good boost for the club going into their home opener. And really had it not been for the own-goal on Jay Heaps we may have just been talking about a 0-0 tie here instead of a 1-1 tie. Early on I really liked what I saw out of Dane Richards. His speed on the wings was a lot to handle for New England and substitute keeper Brad Knighton (Matt Reis was a late scratch from the line up). But give credit to Knighton for coming up big a couple times against the Red Bulls. That has to be a good thing for Steve Nicol to know that if he needs a replacement for Reis for a game or two this year he has a solid one. New England did have a few chances that I felt really could have seen the back of the net. Shalrie Joeseph looked real dangerous on a few times (not just the game-tying goal). I still feel New York’s defense is a few weeks away from being good here. Their reinforcements still aren’t yet available to play but even when they are it will still take some time. Saying that they were better this week than in week one against Seattle. Then again it didn’t take much to be better than that. After a pretty boring first half the Rapids broke through with a nice second half goal by Terry Cooke (remember him?!). But their defense quickly gave up a KC goal to Michael Kraus. Keeping the excitment going though a few mintues later Omar Cummings put home his second of the year to be the game winner. Aside from that 12 minute span, this game didn’t have a whole lot to it other than Kevin Hartman’s record breaking save. Hartman is now the league’s all-time save leader. 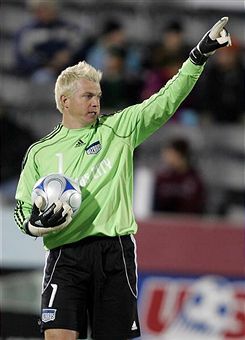 He now stands alove at the top with 1,137 in his career, passing Tony Meola atop the leaderboard. KC had their fair share of chances in the opening 45 minutes but poor finishing an some bad touches didn’t help their cause. The additions of Cooke and Kraus really changed the game though in the second half. Both really injected some much needed energy to the game. Goal of the game though had to go to Cummings with his game winner. Really nothing Hartman could do about it. For two clubs that have offenses that have so many questions it was surprising to say the least to get five goals out of this one. All in the first half nonetheless. From the half-hour mark until halftime this game really entertaining to say the least. Ryan Johnson started things off for the Quakes, followed quickly by a Arturo Alvarez goal. The visitors quickly came back with two of their own with Brad Davis and Chris Wondolowski putting home a goal each. Some how San Jose wasn’t done though, just before the half Frank Yallop got just what he was waiting for out of Cam Weaver, as the big man put home the eventual game winner. I wasn’t too shocked with the result but the scoreline was definitely nice to see out of these clubs as we really didn’t expect this kind of offense out of either of them just yet this season. Houston didn’t look terrible though here but they did seem a bit shakier in the midfield than normal. San Jose did a good job in the first half taking advantage of those chances. The second half was pretty exciting as Houston tried to battle back. Their chances just came up short however. I think we still need to see the Quakes on the road here this year before we can say whether or not they are for real. But based on Saturday night I thought they made a good argument for it. What more can we say about the Sounders here? While RSL looked good and dangerous at times RSL on all ends really showed some class on Saturday night. Some of my questions about RSL’s defense were answered as I still think they are a bit shaky. The goal to Nate Jaqua proves that. You should never leave a guy that big alone in the box like that. Just a great play by the number one overall pick Steve Zakuani to set up Jaqua in the box. If you had questions about his ball skills you just need to watch that set up to Jaqua, it was very classy. RSL did however press a lot in the second half to get the equalizer but again Kasey Keller showed us he still has it here. Big save after big save really seperated things for Seattle on the defensive end. Both Yura Movsisyan and Kyle Beckerman had their chances but it was Keller to the rescue for Seattle. Late in the second half it was Fredy Montero with what has to be the goal of the week. Just a load of space in the midfield given by RSL’s defense to Montero and he made them pay for it in a big way with the 24 foot blast. After the goal RSL really cooled off as Seattle closed the door on the offensive end for the visitors. Two games in and Seattle is at the top of the standings. Give credit all around to this club for it too. I want to see how they are on the road before I really say they are one of the better clubs in the league. If they can prove it on the road we may just have a true contender here. Also, give a lot of credit to those Sounder supporters. A typical Seattle day, cold and wet, though they still showed up 28,000+ strong. A true credit to how well this club is being run here. And one last note, Freddie Ljungberg made his MLS debut. Not a bad one but once he gets healthy he really could make this club that much more dangerous. A real bummer of a game to end the weekend on. Not only was the game a bit sloppy in the midfield but there was no one in the stands to see it. The game went back and forth for the majority of it but it was defensive mistakes again that costed the home side in this one. Mexican striker Eduardo Lillingston found the back of the net mid-way through the second half to put the visitors on top. It was pretty much all the AmeriGoats needed to get the big three points on the road. Dallas had their chances but the finishing just wasn’t there. Ther was better play out of playmaker David Ferreira in this one for Dallas but still not enough to put the club over the top. Dallas still struggled to get a good connection between their playmakers in the midfield and their two strikers up top. They did have a couple more moments in the attack than Chivas but nothing that really tested Chivas keeper Zach Thornton. Late second half sub Bojan Stepanovic gave the visitors the two-goal lead. Stepanovic made his MLS debut Sunday and really made a great impact for Preki’s club. Not a lot of people like what they see out of Chivas but they pretty much remind me of the “Little Engine The Could”. Everyone doubts them but Preki keeps plugging away with a bunch of no-names.